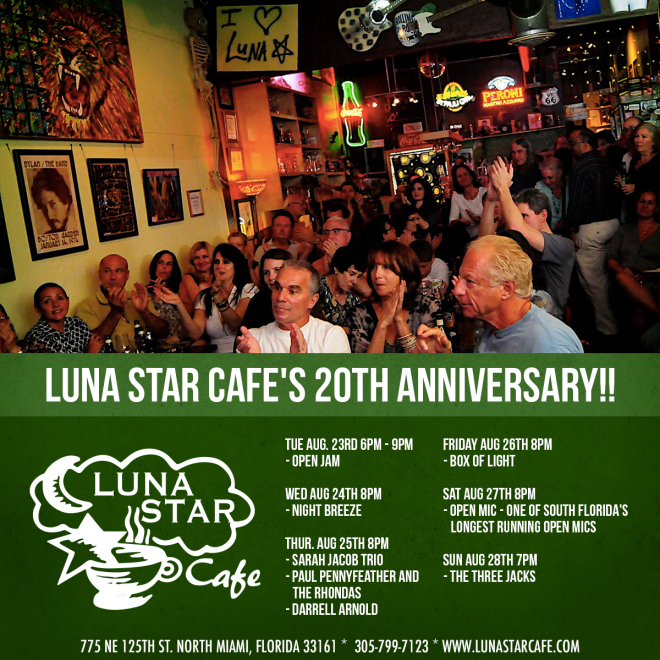 LUNA STAR CAFE’S 21st ANNIVERSARY!! The café was established in May 1996 and opened it doors on August 26th 1996. This coming week marks a milestone for the LUNA STAR CAFE. We have been bringing live music to the greater south Florida area for 20 years. We hope you will join us this week for a glass a champagne to celebrate the 20 years. The cafe is truly a labor of love above all else. It is a community all its own and everyone who is part of this community is family. The cafe has seen people grow; we lost family and good friends, There have been relationships and marriages that have come together and others that fell apart. Some folks stay others go. The friendships that have been made here are golden. It all happens in a small cafe in the middle of nowhere in the midst of nothing in a world all it own and everyone that comes is part of the fiber that holds it together.